Moderate moisture to somewhat dry. Open hardwood forests, forest edges, forest openings. Partial sun. Moderately shade tolerant. 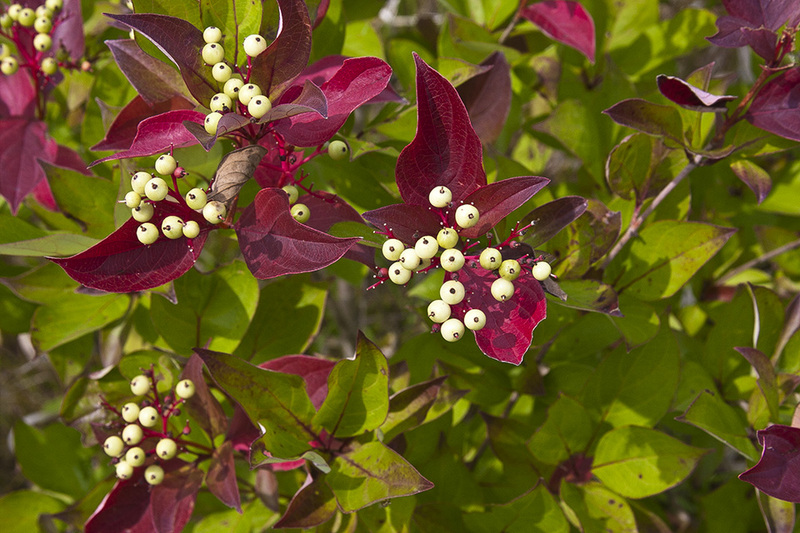 This is an erect, perennial shrub that rises on multiple stems. It can be up to 16′ tall and up to 1½″ in diameter, but is usually much shorter. It rises from a shallow, spreading, woody root system. The central and side roots have buds which may sprout and form above-ground stems (suckers). When conditions permit, it forms colonies which may become large and dense. The stems are erect to arched. In a colony, the middle stems tend to be upright while those on the periphery are arched, forming a rounded clump. First-year twigs are slender, orangish-brown, and smooth to the touch. They are not streaked or spotted. They are hairless or sparsely covered with appressed hairs. Second-year twigs are slender, gray, hairless, and slightly rough to the touch due to small, pale, slightly raised dots (lenticels). 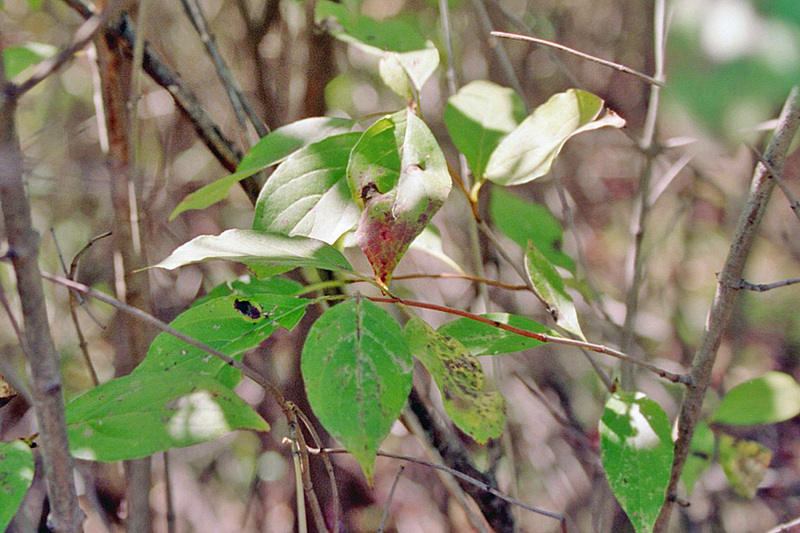 The common name of this plant refers to the color of the twigs. The pith is solid and whitish or tan. The leaf scars are narrow, U-shaped, and slightly raised. 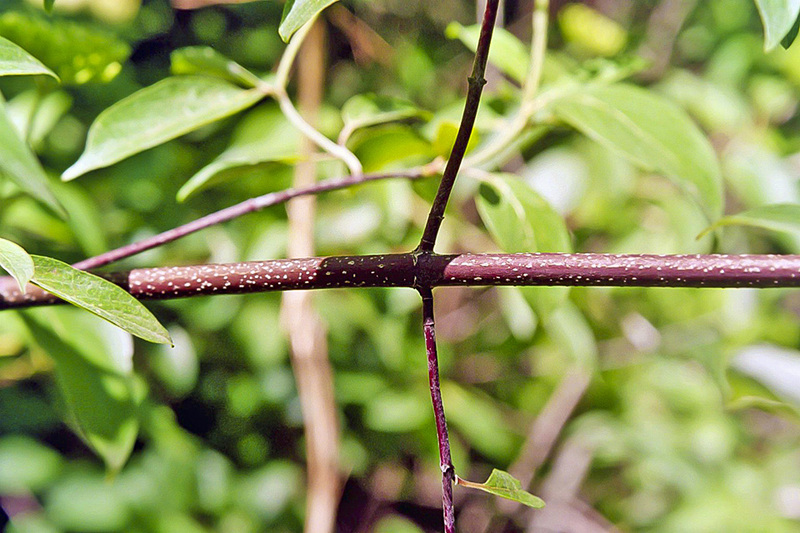 Each leaf scar has three bundle scars and is connected by a thin line to the leaf scar on the opposite side of the twig. The terminal bud is egg-shaped and is covered by two sharply pointed, abutting but not overlapping scales. The scales have whitish tips, appearing frosted. Lateral buds are similar but smaller. The bark on young stems is gray and smooth or somewhat rough and shallowly fissured. On older stems the bark is grayish-brown, rough, and divided into thin, irregular plates. The leaves are opposite, deciduous, and evenly distributed along the branch. The leaf stalk is slender, sparsely covered with minute hairs or almost hairless, and 3 ⁄16″ to ⅝″ long. The leaf blade is egg-shaped, elliptic, or inversely egg-shaped, 2″ to 3½″ long, and ¾″ to 1¾″ wide. It is tapered at the base and tapered to a sharp point at the tip with concave sides along the tip. On each side of the midrib there are usually 4, sometimes only 3, conspicuous veins that curve upward toward the tip of the leaf. The upper surface is dark green or green and hairless or sparsely to moderately covered with straight, mostly appressed, T-shaped hairs. The lower surface is pale or whitened, slightly rough to the touch, but otherwise similar to the upper surface. The margins are untoothed. 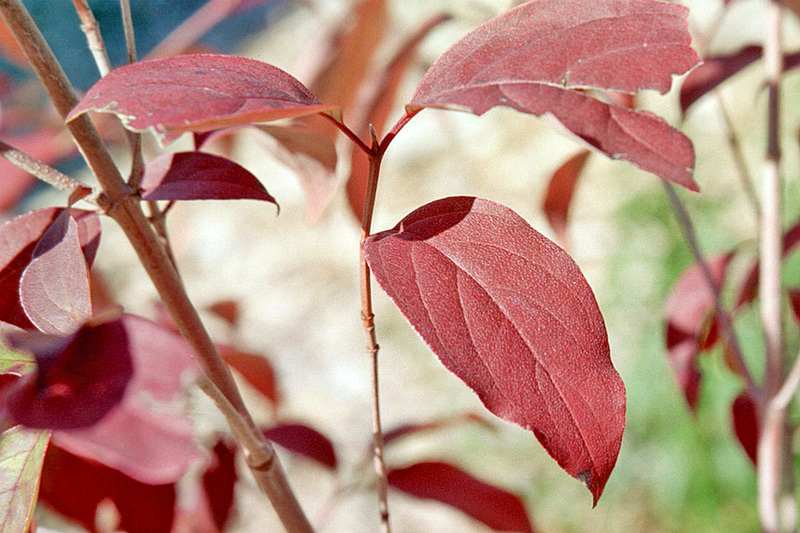 The leaves turn reddish or purplish in the fall. 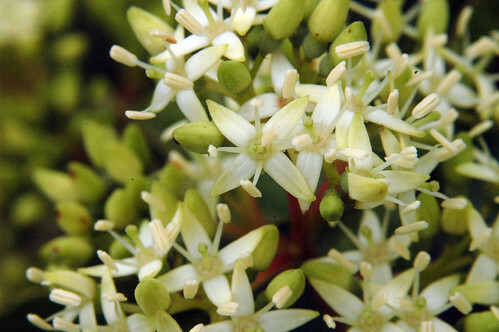 The inflorescence is a dense, pyramid-shaped, branched, cluster (panicle) of 20 to 75 flowers at the ends of branches. The panicle is ¾″ to 1½″ tall and 1¼″ to 2″ wide, about as tall as wide. 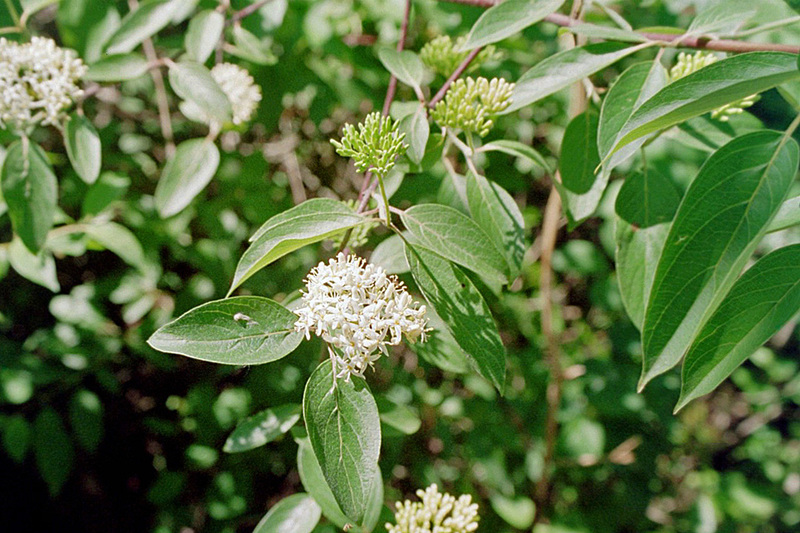 The flowers are on stout, cream-colored, hairless or sparsely hairy, 1 ⁄16″ to ¼″ long stalks (pedicels). They reach peak flowering time in early June to early July. Each flower has four sepals, four petals, four stamens, and a well-developed style. The sepals are fused for most of their length and separated at the tip into four minute teeth. The petals are white or creamy white, narrowly oblong lance-shaped, and ⅛″ to 3 ⁄16″ long. 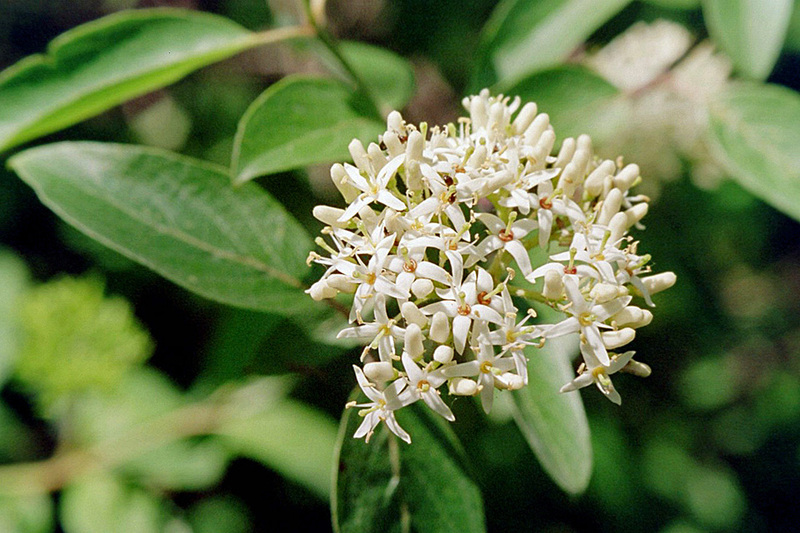 The stamens have long cream-colored filaments and white or yellowish anthers. The style is slender, cream-colored, 1 ⁄16″ to ⅛″ long. The fruit is a berry-like, 3 ⁄16″ to 5⁄16″ in diameter drupe with one or two seeds. It is green initially, turning white or light blue. It matures in early August to early September. The pedicels become bright red in fruit and persist and remain red well into winter. 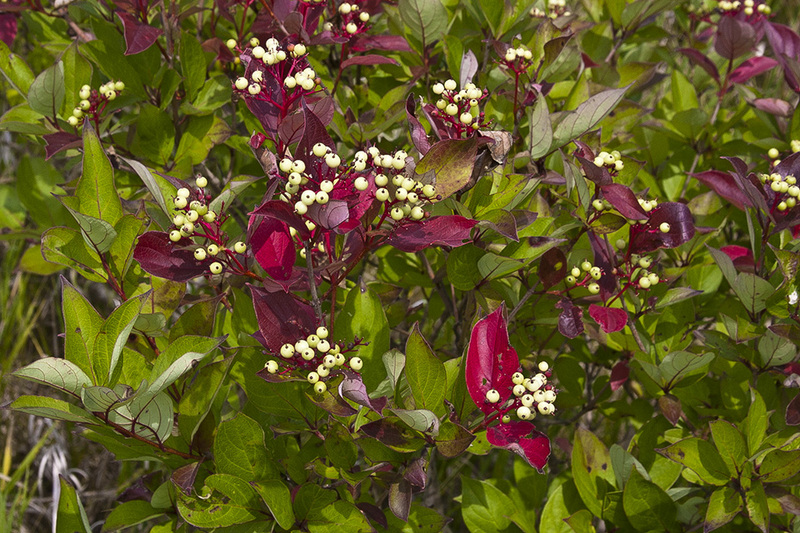 Red osier dogwood (Cornus sericea ssp. sericea) first- and second-year twigs are red, greenish-red, or grayish-green. Bark and twigs turn red in winter. The pith is white. The leaf stalks areup to 1″ long and are hairy. The leaves have no more than five or six veins per side. The leaf undersides are glaucous. 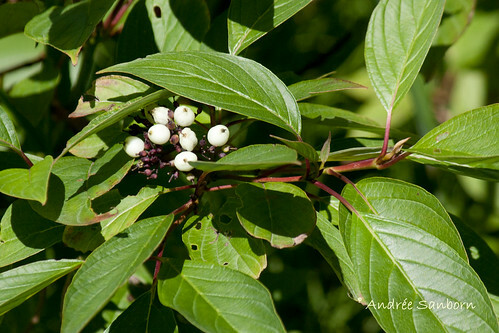 Silky dogwood (Cornus amomum ssp. 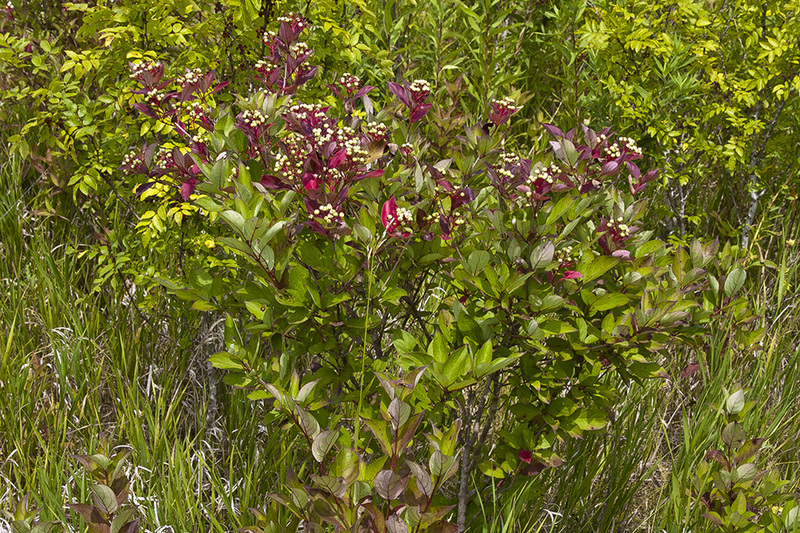 obliqua) second-year twigs are greenish-purple, purplish, or reddish-purple. The pith of second year in older twigs is brown. The leaf blades have usually 5, sometimes 4, pairs of lateral veins. The underside of the leaf may be pale green but is not whitened. The inflorescence is wider than tall, flat-topped to shallowly convex, not pyramidal. The fruit is pale blue with white patches, becoming dark blue at maturity.